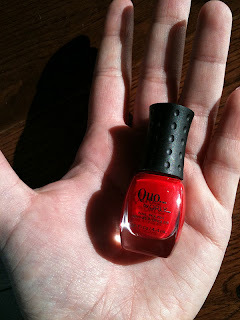 For my birthday this year (December 10th, so not too long ago) my sister gave me this little Quo by Orly polish along with a lovely shirt. 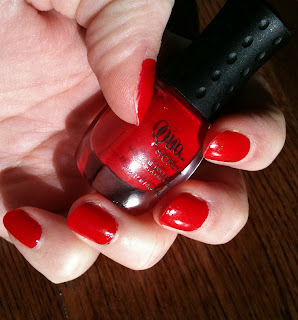 This polish is a true red that doesn't lean blue, pink or orange. It didn't come with a name as it's a mini bottle but I believe in full size it is Red Hot. It's a perfect festive shade for the holidays, exactly the colour of Rudolph's nose or Santa's suit. All my photos are coming up a little orange but it doesn't have that cast in real life- it's a bright cherry red. I was actually really impressed by the formula of this little polish. It was almost completely opaque in one coat and it glided on really nicely. The brush though small was very good too, firm but flexible. In the photos I'm not wearing any base or top coat so as you can see it's quite shiny. It also seems to be wearing well so that's a bonus. Beware those that have big fingers though! This bottle is tiny! I have small hands to begin with so you can sort of get an idea from the photo above. The little bottle stands about 2 1/2 inches high. But such a cute way to try a shade don't you think? 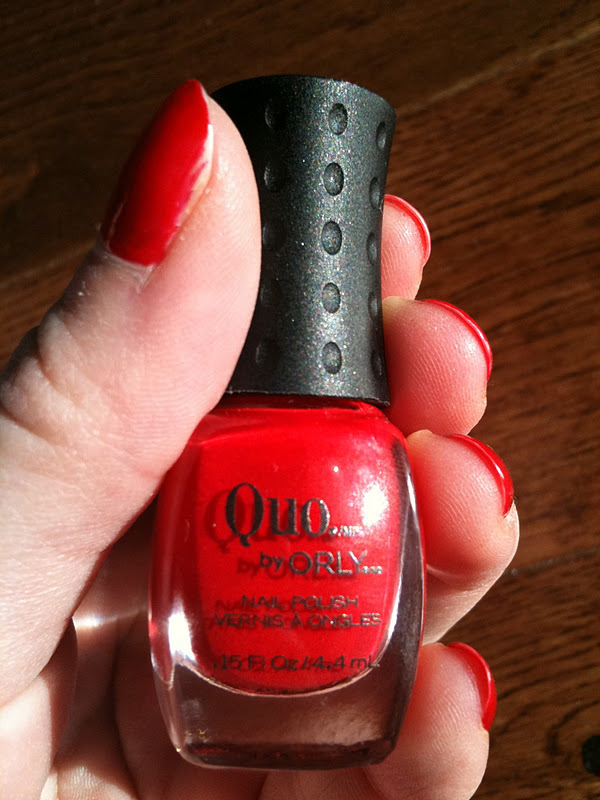 Quo by Orly polishes are available in Canada at Shopper's Drug Marts. Overall, I like the colour, the packaging and the formula. Plus it's tiny so it doesn't take up a lot of room. Heck I may actually be able to finish a polish this size! Classic. Sprite Rating: 9.5/10 Not sure why I took off a 1/2 point but I guess I just don't feel it deserves a perfect score. Maybe for the super small handle of the brush. Would I buy this again? 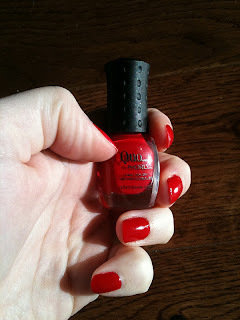 Yes, the formula was great and the mini is adorable, especially for colours you aren't planning on wearing too often.